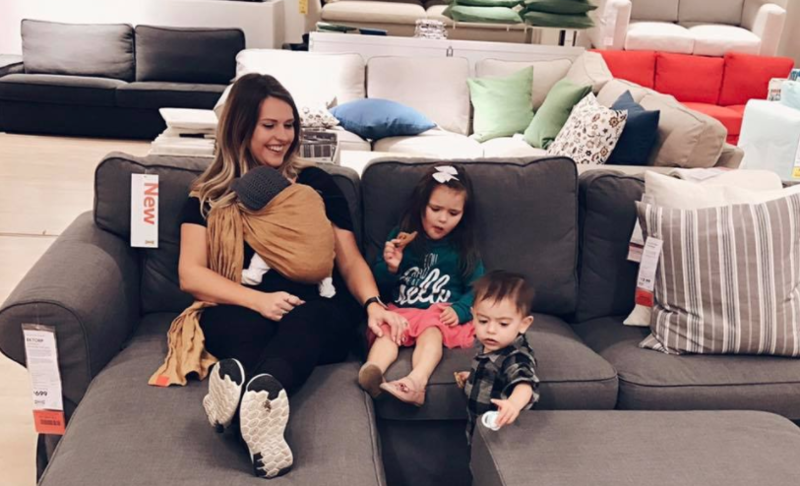 Diandra Toyos was casually browsing for a new couch with her mother and three children at IKEA last week when she felt a suspicious set of eyes staring at her. The mom from Covina, California, said a middle-aged man was circling the area, getting closer and closer to her 4-year-old daughter and 1-year-old son, who were “testing out” the furniture. Toyos says as she moved throughout the store, the man followed close behind. Then another man, who appeared to be in his 20s, joined in. He also appeared to be circling the family, occasionally picking up items and putting them down as he walked through the showrooms. “We had a gut feeling something was going on, but we hoped we were wrong and they would move on,” Toyos said. The family decided to take a 30-minute break on a couch in one of the store’s display rooms. The problem, Toyos said: They sat down on a couch right across from us the entire time. As soon as Toyos stood up, she grabbed a store employee and that’s when she says she lost them. “Something wasn’t right. I am almost sure that we were the targets of human trafficking,” Toyos claimed in a Facebook post detailing the creepy encounter. The post went viral with more than 105,000 shares — mostly from concerned parents. Before leaving the store, Toyos stopped by IKEA’s security desk to report the incident. Though IKEA has not yet returned CBS News’ request for comment, Toyos says officials at the store told her they would review the footage and take any necessary steps from there. She hasn’t heard any updates since. The Covina Police Department said they only heard about incident through social media. Human trafficking expert witness Dr. Kimberly Mehlman-Orozco agreed. If you look at evidence in cases of convicted human traffickers, kidnapping is very rare, Mehlman-Orozco explained. In 2016, human trafficking activist group Polaris reported learning about 8,042 cases of human trafficking in the U.S. — a 35 percent increase from the previous year. More than 31,650 total cases of human trafficking have been reported to the National Human Trafficking Hotline in the past decade. It’s clearly a growing threat, which Mehlman-Orozco believes should be addressed through fact-based education — not viral posts on social media. Human traffickers generally appear extremely kind and knowledgeable, Mehlman-Orozco said. They speak and act on par with whoever their target is, typically kids in their early teens. First, they find someone vulnerable, usually from a homeless shelter, school or social media. Then they lure their victims through false promises, faux relationships, deception and coercion. Mehlman-Orozco has conducted over 2,000 interviews with human traffickers and victims, and she says she’s never heard of a situation where someone was trafficked or kidnapped from a public place like IKEA. But that doesn’t mean Toyos didn’t have reason to be concerned. Toyos says she wanted to share her story as a warning for parents to keep a close eye on their children.